Tomorrow will be Sunday 29th April, 11 years to the day since the day MMRG - and now many others - suggest that Madeleine died. On 6 March 2008, members of the Madeleine McCann Research Group (MMRG) wrote to the Portuguese Attorney-General, Dra Joana Marques Vidal, enclosing a dossier of evidence concerning the disappearance of Madeleine McCann. It included links to 47 articles or documentaries where further information could be obtained. The Portuguese police investigation into Madeleine McCann was archived in July 2008, pending the receipt of ‘new and credible evidence’ which might lead to the investigation being recommenced and possibly to the arrest of any person responsible for Madeleine’s disappearance. Our dossier contained several lines of evidence which suggested not only that Madeleine died her parents’ apartment but also that she may have died as early as Sunday that week (29 April 2007). On 28 March, the Head of Cabinet for the Attorney-General, Helena Goncalves, replied, stating that the case had been referred to the Chief Magistrate in Faro for further investigation. It should be noted that, unlike in Britain, the Portuguese police, the Policia Judiciara, do not undertake investigations on their own initiative but are authorised to do so by the Attorney-General’s Department, which in turn refers local organisations to the local Chief Magistrate. 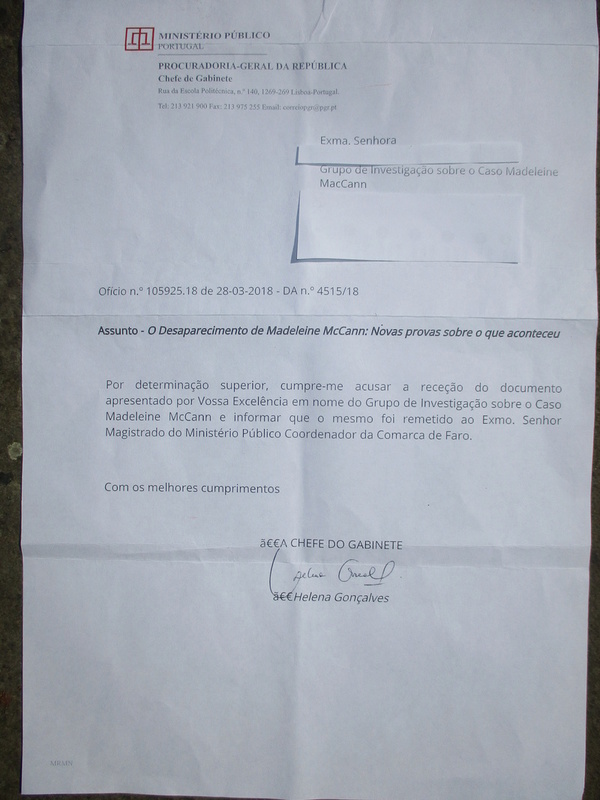 Acting on a higher order, I am writing to acknowledge the request of the document presented by your Excellency on behalf of the research group on the Madeleine McCann case, and to inform that it was now been forwarded to the Honorable Member, the Chief Magistrate of the Co-ordinator for the Ministry of the Public for the Faro District County”. Our original letter was translated by Paulo Reis, the Portuguese journalist who took a major interest in the case and published many well-researched articles on the case between 2007 and 2009. Our letter, in both English and Portuguese, is on his website. “It is true that the Policia Judiciara did re-open their investigation in 2013 after the Operation Grange review became a formal investigation. This was done mainly to comply with the request of the British police, who claimed they had ‘dozens’ of new ‘lines of enquiry’. But in fact, a review of the files had already been ordered before 2013 by the Attorney-General. She established a special team of 8-10 PJ officers, headed by a ‘top’ Criminal Investigation Coordinator in Oporto. “But the investigation re-opening was what we call a ‘soft reopening’. The case remained in the hands of Criminal Judge of Portimão Judicial Circuit (it's the third-tier investigative body in our judicial system. You have the Attorney-General, then the PJ, and then you a Criminal Judge who directs the cases, the Attorney-General and the PJ are finished with them. Then we also have the Court Judges, who try the cases). “Now there is a team of 8-10 PJ officers from Faro working with Operation Grange. It’s what we call a ‘small’ team, with no extra manpower and/or budget assigned to it. “In the Attorney-General’s Department we have a special department called DCIAP in Portuguese – the Central Criminal Investigation Department. It's directed by the Attorney-General and deals with major criminal cases. They always get the money, resources and the people they ask for. It was the DCIAP that pursued the investigation into corruption allegations against former Prime Minister Jose Socrates. The case against him is still ongoing. “It’s an interesting question as to why Maddie's case was not assigned to the DCIAP in 2013. It maybe because the Attorney-General and her staff do not think the case requires the help of DCIAP. The story of the claimed abduction obviously “has no legs to walk”, as we say in Portuguese. “So the case was instead sent case back to Portimão, where the investigation goes on”. We thank Paulo Reis most warmly for all his help. We will shortly be sending a further dossier to the Attorney-General. 1 Richard D Hall’s third Madeleine McCann film: When Madeleine Died? 2 Richard Hall’s fifth Madeleine McCann film: Madeleine: Why the Cover-Up?